Later this year, a team sponsored by Thomson Reuters will attempt to break the speed record for reaching the South Pole by land. Here's the first unofficial pictures of the custom truck they'll use in their quest. 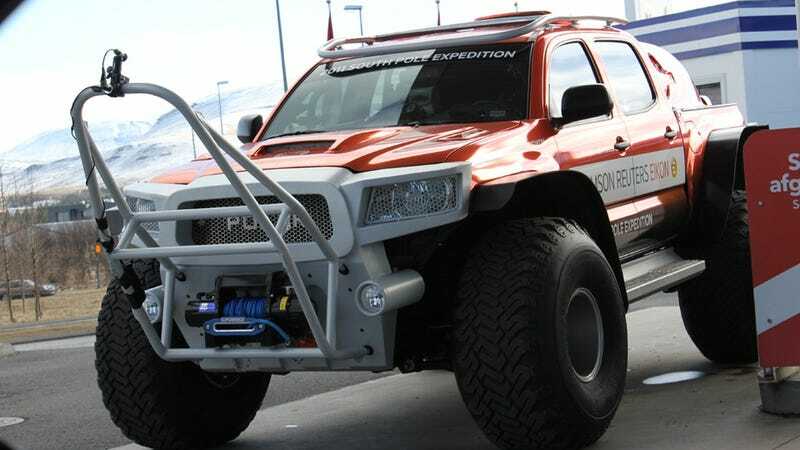 Built by Artic Trucks in Iceland — the same firm that outfitted a Toyota to North Pole duty for Top Gear — the Polar Performance Vehicle appears to be based on a Toyota platform as well, but with several massive modifications for speeding across sheets of ice. The 4.0-liter V6 makes about 340 hp on an unspecified biofuel mixture; and while the frame includes safety bolstering and crevasse-protection bars, it's also been kept as light as possible. In addition to the engine, the polar explorer will also have two other sources of power; solar cells and a wind-powered generator so that if the vehicle is forced to stop, it can still generate energy. The current record for traveling to the South Pole by land is two days, 21 hours and 21 minutes, a record the Thomson Reuters team hopes to smash with a three-person crew this December — including one who won a contest for a seat.